CryptoDelegate delegation service is the best alternative to running your own node. 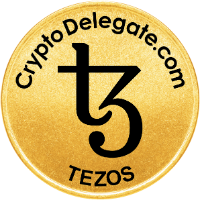 The easy way to grow your Tezos stake is to Delegate your XTZ Tezzies. With us as your Tezos Delegate, YOU EARN RENT/INTEREST in the form of newly "baked" Tezos. ​No more power hungry, GPU intensive, crypto currency mining. Curious on the Pros and Cons of new Protocol Upgrades? We will help you gain that knowledge too. Sit back, relax, grow your Tezos, and let us do the hard work for you. We pay you rent/interest on your unused Tezos Stake that you delegate to us. You Pay Nothing. CryptoDelegate.com removes all the confusion around hosting a Blockchain node and Baking new Proof of Stake tokens. Protect yourself from inflation dilution by delegating the work to us. Sit back and relax while we grow your crypto portfolio automatically. We do not ever receive client Tezos because when you delegate to us, you keep physical possession of your Tezos in your personal wallet. You simply add our delegate code to your wallet signifying to the system that we are your delegate. Log in with just an email to our site to track your growth progress. If you are concerned about email anonymity, we recommend using a new email anonymous email for our login. To "Bake" new Tezos, the owner (or Delegate) must create a bond that ranges from 8% to 15% of all the Tezos that is currently being Delegated and Baked. This bond insures that the Tezos creation process is done ethically and nobody tries to game the system. If there is any strange unethical behavior, the user will lose their bond and all the Tezos. CryptoDelegate pays this bond out of our own wallet Tezos reserve so you do not have to. This eliminates your bond risk. As your Delegate, we pay you rent in the form of new freshly baked Tezos in exchange for you allowing us to use your unused Tezos stake. Don't let system inflation dilute your total Tezos value. Put your Tezos to work. Don't miss out by letting your Tezos sit idle.